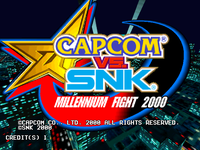 Capcom vs. SNK: Millennium Fight 2000 (カプコン バーサス エス・エヌ・ケイ ミレニアムファイト 2000 Kapukon Bāsasu Es-Enu-Kei Mireniamu Faito Nisen?) is a 2000 head-to-head fighting game produced by Capcom originally released as a coin-operated arcade game for Sega's NAOMI hardware and later ported to the Dreamcast. It is the second fighting game crossover involving characters owned by Capcom and rival fighting game developer SNK, particularly from their flagship fighting game franchises Street Fighter and The King of Fighters respectively (see SNK vs. Capcom), and the first game in this series of crossovers to be released for the arcades.